I've been sworn to secrecy for the last two years but I am now pleased to announce the publication of a new book Advanced Genetic Genealogy: Techniques and Case Studies, edited by Debbie Parker Wayne. I contributed a chapter on "The promise and limitations of genetic genealogy" where I had great fun speculating about what the future holds for genetic genealogy. There are another thirteen chapters contributed by many well known names in the genealogy world. I've not yet seen the book or had the chance to review any of the chapters so I'm very much looking forward to reading it when my copy arrives. Debbie Parker Wayne has worked really hard behind the scenes to bring this much-needed book to fruition and I am very grateful for her patience and encouragement. The book is currently on sale on Amazon. On the US site the book is showing as being available for shipping within the next one to two days. On the UK site delivery is expected within the next one to two months. A Kindle version will be available in May 2019. For US readers who are going to the National Genealogical Society conference in May you will be able to buy a copy from Books and Things who will be exhibiting at the conference. For details see here. If you click on the Amazon UK links in this blog it is vaguely possible that at some point in the distant future I might receive a microscopic payment from Amazon as part of their affiliate scheme to help support my writing. Using the affiliate links makes no difference to the prices you pay. At Rootstech last weekend Ancestry announced the launch of three new features: Tree Tags, ThruLines, and New and Improved Matches. The announcement was made in the keynote speech by Margo Georgiadis, Ancestry's new CEO, which you can now watch on YouTube. Margo stated that Ancestry host 100 million family trees, and that they "will soon have more than 15 million people" in their DNA network, making it the largest consumer DNA database in the world. Crista Cowan provided a live demonstration of the new tools in her presentation "What you don't know about Ancestry". The recording of her talk is now available on the Rootstech website and is well worth watching if you want to get a good overview of the new features. I also recommend watching Diahan Southard's talk on Connecting your DNA matches, which shows how to use the tools to form genetic networks, but also highlights some of the limitations. The Tree Tags and New and Improved Matches are currently in beta testing. You can opt in to the beta by accessing the new AncestryLab menu on your Ancestry account. This can be found under the Extras tab. ThruLines has been rolled out to the entire AncestryDNA database and you will see the feature when you log into your DNA account. The screenshot below shows what my home page now looks like. The new matches experience replicates the functionality of the third-party Chrome extensions MedBetter DNA and DNA Match Labelling, which many of us found very helpful for managing our matches. These extensions are now redundant. If you have previously used the extensions you need to be aware that they won't work with the new system. Before participating in the beta you might want to make a note of all your groupings and tags so that you can transfer them to the new interface. Because these new tools are all in beta testing it's important to remember that the features may change and new functionality might be added. If you spot any bugs or have suggestions for improving the tools make sure you submit feedback to Ancestry. So now let's have a look at the Improved Matches and ThruLines features and see how they work in practice. I currently have 24,900 matches at AncestryDNA, which is far more than I could ever possibly hope to investigate. Any tools that will help me to sort and filter these matches to find the most useful ones are always going to be welcome. Below is a screenshot of my new matches page. I've tested both my parents and matches are now allocated to the father's side and the mother's side. However, the parental sides are only shown for my 162 fourth cousin and closer matches. It would be really helpful if Ancestry could extend this tool to show the sides for the more distant matches, or at least for the first 1000 or 2000 matches on your match list. You will also notice that the amount of shared cM has been round up to the nearest whole number. I always write fastidious notes about my matches and the notes can now be viewed directly from the matches page without having to click through to view the match. This functionality was previously only available when using the MedBetter DNA extension. You won't be able to see the full note on the matches page, but you can click on the note symbol, as in the screenshot above, to read the full text. Previously we could view 50 matches on a page. Now there is an infinite scroll system which means that you can keep scrolling down the page and see more and more matches. This is very handy if you're trying to search by keyword for particular matches. I can now, for example, see all my fourth cousin and closer matches on a single page. Previously you could use the page numbers to work out how many pages of matches you had, which then allowed you to calculate the total number of matches. I can't currently see any way of replicating this function with the new system. (*See the update at the end of this article.) If you want to know how many matches you have you can use the DNAGedcom Client to download your entire match list. The Client is available for a modest subscription from DNAGedcom. The updated match list has a number of new filters for sorting your matches. You can sort by close matches, distant matches, matches you haven't viewed, matches with notes, matches you've messaged and tree status (private linked trees, public linked trees and unlinked trees). Unfortunately the facility to filter matches by sub-region has temporarily been lost but I understand that it will eventually be restored. The good news is that it's now possible to create custom groups which can be labelled and assigned a colour. This new feature is modelled very closely on the DNA Match Labelling extension, but provides additional functionality such as the ability to filter matches by custom group. You can also have more than one coloured dot for each match. There are 24 different colours available. I'm still experimenting with the coloured dots but an obvious use of the custom groups is to assign different colours to specific surnames or ancestral couples. I've added a coloured dot for matches which don't have any shared matches. I can use this filter to go back and check these matches from time to time to see if they do now have any shared matches. Currently 23 of my 162 fourth cousins or closer (14%) don't have any shared matches. It will be interesting to see if the percentage drops over time as more matches start to come in. I also have a coloured dot for what I call "dodgy matches". These are matches which share substantially less DNA with my parents than they do with me and are therefore not likely to be worth pursuing. Currently 29 of my 162 fourth cousin or closer matches (18%) fall into this dodgy category. In some cases there is a discrepancy of 10 cM or more. One match appears to share 22.3 cM with me but shares just 6.5 cM with my dad. Two of my dodgy matches actually share small amounts of DNA with both of my parents. One appears to share a single 21.2 cM segment with me but this is actually two segments: a 7.8 cM segment shared with my mum and a 6.5 cM segment shared with my dad. My second double-sided match shares 20.1 cM across 2 segments with me but this translates into a 6.1 cM segment shared with my mum and an 11.9 cM segment shared with my dad. I've not found any genealogical connection between my mum and dad within the last 400 years and these double matches are likely to be signals of very distant sharing dating back hundreds of years. The screenshot below shows some of the custom groups I've started to use. No doubt my system will evolve over time. The coloured dots currently sort alphabetically so I might at some point decide to introduce a numbering system to get them to sort in a particular order. AncestryDNA's shared ancestor hints, otherwise known as shaky leaf hints, have now been renamed as common ancestors. I previously only ever had six shared ancestor hints and two of those were with my parents. I now have 20 common ancestors, though again two of those are with my parents. The shaky leaf hints only used our family tree and the trees of our matches to identify a shared ancestor. The common ancestors feature compares family trees and then deploys the power of other people's family trees to try and identify the common ancestor. The common ancestor feature is a useful tool to guide your research but every link will need to be carefully checked, and extreme caution needs to be exercised when matches are identified with more distant cousins. Below is an example of a predicted common ancestor with a half sixth cousin. Ancestry have used my tree and my cousin's tree and then used a third-party tree to link the two lines together. Tidbury is indeed a name which appears in my family tree. The surname is concentrated in Berkshire and Hampshire and it's quite likely that I share a genealogical relationship with this match. However, the Tidburys are on my mother's side and this cousin matches me through my father so there is clearly no genetic connection. 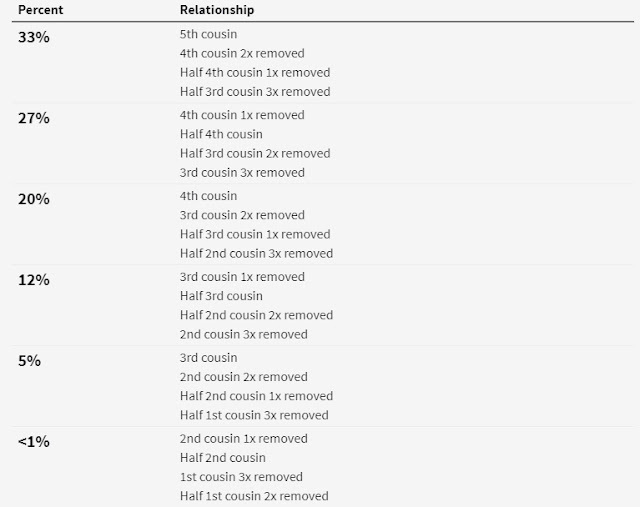 Even if the genetic connection was real, the total amount of DNA shared is very small and there is currently no way of assigning a single small segment like this to a sixth cousin with confidence. ThruLines is a replacement for DNA Circles. The DNA Circles feature will continue in parallel to ThruLines for now but is no longer going to be updated. While DNA Circles was an interesting concept, in practice it was only of use to a subset of the AncestryDNA database because of the strict requirements needed to create a circle. I only ever had one DNA Circle, but AncestryDNA have identified 57 potential ancestors for me with the ThruLines feature. Your AncestryDNA results must be linked to a public or private searchable family tree. You must have DNA matches who have also linked their results to a public or private indexed family tree. AncestryDNA have said that the feature will come out of beta testing when they have had enough feedback to validate the value of the tool to their customers, including whether or not the feature will require a subscription. With ThruLines you get a DNA record card for each ancestor for whom you have a DNA match. If you click on the card you will get a report showing the possible pathways through which you and your matches are connected to the ancestor. The pathways are filled in not just from your own family tree or the family trees of your matches but from multiple Ancestry family trees. This is essentially a machine-learning algorithm deploying the power of big data to make connections. I would guess that, like the We're Related App, the feature is generated by the AncestryDNA Big Tree. For information about the Big Tree I recommend reading the very informative blog post by Randy Seaver "Is there really an Ancestry.com Big Tree?" You can filter the ThruLines in three ways. If you filter by ancestors from your linked tree you will be given descendant reports on your matches who meet the required criteria and who share the ancestors featured in your tree. This is a very useful way of locating matches who descend from a specific ancestor. If you filter by potential ancestors you will be able to view links that Ancestry have made between you and your matches by stitching together multiple family trees to make connections. The third option is all ancestors which will show you all your potential ancestors and all ancestors from your linked tree. ThruLines goes back seven generations to fifth great grandparents which means that you will not get potential ancestor hints with anyone who is not a sixth cousin or closer. The example belows show a genetic descendancy report for my great-great-great-grandfather Samuel Trask. It shows my line of descent on the left and then the lines of three of my matches and their lines of descent down to the present day with the speculative links highlighted with dotted boxes. In this particular case the connections were hard to make because these matches were related to me through a female line. I hadn't noted these changes of surname upon marriage in my family tree so I might not have spotted these connections easily without this feature. However, caution will need to be exercised and the trees of these matches will need to be evaluated independently. I will also have to check the amount of shared DNA to see if it is consistent with the hypothesised relationships. The example below shows a potential ancestor that Ancestry have identified for my great-great-great-grandfather Thomas Thorn. Two cousins who are potentially related to me through Thomas Thorn are shown, and Ancestry have also identified William Thorn as Thomas's possible father because of a DNA connection through Robert Browning Thorne. I have insufficient evidence at present to evaluate this possible link but it may be that I will get more matches on these lines in future which will provide further clues. One disadvantage of the ThruLines is that the potential ancestor feature is triggered even if your only DNA match is with a parent. As I've tested both of my parents I'm finding that a lot of the potential ancestors are only appearing because of a single parental match. Ideally parents should be excluded from the feature or there should be the ability to filter out matches with parents. The feature seems to be most useful for identifying how you are connected to your DNA matches. It's particularly helpful for the fifth to eighth cousin matches which are otherwise very difficult to search. In many cases the matches only share very small amounts of DNA under 10 cM and I'm not convinced that the DNA match is a result of the documented genealogical connection. Nevertheless, it's still useful to identify more genealogical cousins and to have the opportunity to communicate with them about our shared surnames and family trees. A nifty bonus feature of the Improved DNA Matches and the ThruLines is that you can now generate a table showing the possible relationships and the probabilities of those different relationships. This is very similar to the Shared cM Tool on the DNA Painter website. The DNA Painter tool uses probabilities based on simulated data from the AncestryDNA Matching White Paper combined with ranges derived from the Shared cM Project. These new tables from Ancestry are based on simulations. They've not released any details but I'm hoping that they will publish a white paper or blog explaining the methodology behind their calculations. You can access the probabilities table from your new matches page by clicking on the question mark next to the amount of shared DNA. You can access the tool from the ThruLines feature by clicking on the amount of DNA you share with your matches in the descendancy chart. 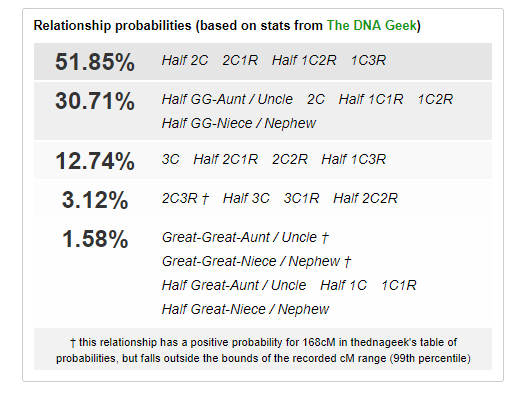 Here is the probability table from Ancestry for one of my second cousins with whom I share 168 cM. Interestingly, Ancestry have predicted that this person is my third to fourth cousin whereas the probabilities show that he is more likely to be a second cousin. 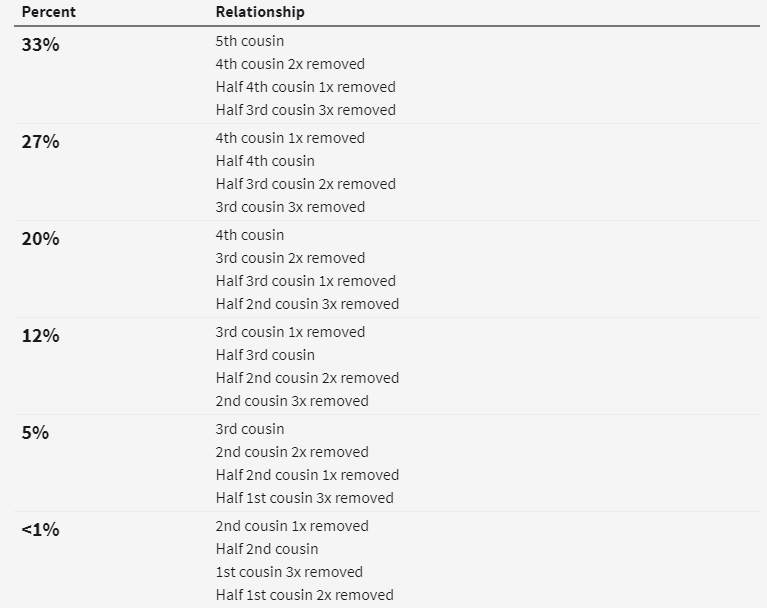 If I plug the amount of shared DNA (168 cM) into the Shared cM Tool at DNA Painter I get the following probability table which suggests that this cousin is slightly more likely to be a half second cousin than a full second cousin but still has a reasonable probability of being a second cousin. I've found that Ancestry's probabilities are not so realistic for the more distant relationships in the fifth to eight cousin category where people share much smaller amounts of DNA. Most of the matches identified with the ThruLines feature appear to fall into this category. The Ancestry simulations don't seem to have gone beyond the fifth cousin level. As a result, the probabilities suggest that almost all of your DNA matches, however little DNA they share, will be fifth cousins or closer. Here's the probability table for the predicted half sixth cousin I mentioned above who shares just 10 cM with me. 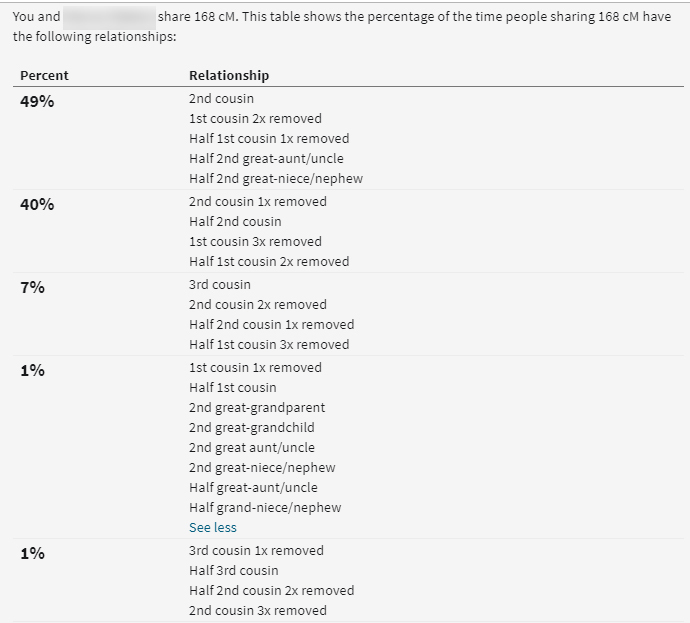 The table suggests that 98% of cousins sharing 10 cM will be fifth cousins or closer. A half sixth cousin doesn't even appear as a possibility. This prediction is actually in conflict with Ancestry's confidence scores. Matches sharing 6-16 cM are classified as moderate confidence matches with only a 15-50% chance of sharing a single recent common ancestor. Ancestry say that for moderate confidence matches "You and your match might share DNA because of a recent common ancestor or couple, share DNA from very distant ancestors, or you might not be related." Two separate studies have also shown that 10 cM segments can potentially go back a long way and can perhaps date back twenty or thirty generations. A chart from a 2012 study by Speed and Balding reproduced in the ISOGG Wiki shows that less than 40% of 10 cM segments are likely to fall within the last 10 generations. The Speed and Balding paper used computer simulations. A 2013 study from Ralph and Coop, using real life data from the European POPRES dataset, showed that while most 10 cM segments are likely to come from the last 500 years, we have many more very distant cousins so the vast majority of 10 cM segments will be shared through very distant ancestors. The authors go on to say that "the typical age of a 10 cM block shared by two individuals from the United Kingdom is between 32 and 52 generations". The distribution will vary depending on a given population's shared history. I would suggest that Ancestry need to refine the parameters of their simulations to allow for more distant sharing and to produce more realistic probability tables for matches sharing low amounts of DNA. In the meantime, when weighing up the strength of DNA evidence, you need to bear in mind the uncertainties in the predictions when sharing small amounts of DNA. If you share a single 10 cM segment with a cousin there is currently no way of determining whether you are matching as sixth cousins or sixteenth cousins. These new features from Ancestry are very welcome. The new matching interface is already making it much easier to navigate and sort our matches. ThruLines is likely to be a valuable tool for identifying potentially interesting matches to follow up. The predictions are likely to get better over time as more data becomes available and as the machine learning improves. Remember that any tool has to be used carefully. It provides clues but does not give you all the answers. You will still need to evaluate the DNA evidence in combination with the genealogical evidence. Check out the All Matches filter in your new match list. 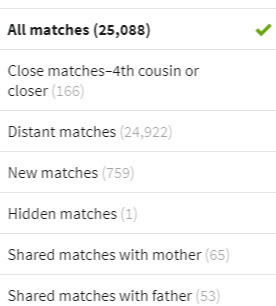 AncestryDNA have now included stats on the total number of matches, the number of close and distant matches, the number of new matches and matches shared with your mother or father. I now have 25,089 matches, 166 of which are predicted to be fourth cousins or closer. The following blog post was written by David Balding and Debbie Kennett. It is based on an article written in collaboration with Mark Thomas and Adrian Timpson entitled The rise and fall of BritainsDNA: a tale of misleading claims, media manipulation and threats to academic freedom, published in the peer-reviewed journal Genealogy. In just a few weeks the article has achieved the distinction of being the most viewed article in the journal's history. As of today's date it has been seen 3,658 times, and 2,190 people have downloaded a copy of the article. The blog post was originally intended for publication in The Conversation. However, the piece was subsequently rejected because the website's lawyer considered that it was "potentially defamatory in its current state". The Defamation Act of 2013 includes a provision for matters of public interest and provides special privileges for statements published in peer-reviewed journals. We believe that there is a strong public interest in highlighting this story. It is important that academic debate is not stifled by legal threats. There is nothing in the blog post which is not already referenced in our peer-reviewed article. We have therefore published it below in its entirety. The worlds of academia and industry are getting closer than ever before. Academic scientists are encouraged to engage directly with industry through consultancy roles, and to commercialise their research through the creation of new enterprises. At the same time, research institutions encourage promotion of resulting new findings to a broad public through the news media. These trends can lead to conflicts of interest. Media savvy companies can and do attract free coverage for their science-related business under the guise of a public interest science story. It is possible that universities could collude with this deception in their eagerness to attract media attention by allowing a scientist to use the university brand in media presentations, without acknowledging the business motivation. Our new case study of the former consumer genetic ancestry testing company BritainsDNA, published in the journal Genealogy, sheds light on how conflicts of interests can play out in reality. Genetic ancestry tests are important tools for genealogists when used in combination with documentary and historical records. Y-chromosome DNA (Y-DNA) tests can be used to trace a man’s paternal ancestry, while mitochondrial DNA (mtDNA) provides information about ancestry on the direct maternal line. There are also autosomal DNA tests (the autosomes are the chromosomes other than the X, Y and mtDNA, and contain most of your DNA) which are useful in finding matches with genetic relatives in a database. 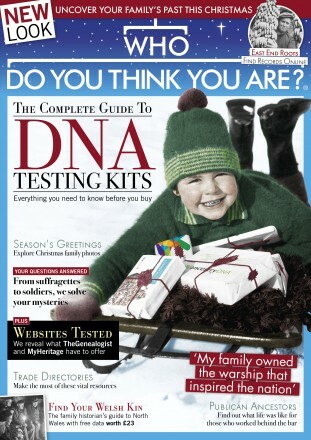 Autosomal DNA tests are now the most popular tests. Ancestry testing is a multi-million-dollar industry, and around 18m people have now tested worldwide. Such tests can be very reliable to reveal ancestry in recent generations. However, once you go beyond about 10 generations back, only a small fraction of the DNA of ancestors will have contributed to a living individual’s DNA. So while there’s a lot of research on human history through DNA, there is little that can be said that is specific to the customer. That means these tests cannot be used on their own to determine exactly where you came from. 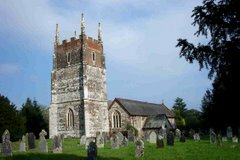 BritainsDNA was active before the growth of the autosomal DNA databases and focused on Y-DNA and mtDNA testing. They were able to achieve substantial favourable coverage in newspapers, radio and television, with stories drawing questionable links for example between contemporary British people and the Queen of Sheba. In another promotion, the public service Welsh-language TV channel S4C ran a five-part series called “DNA Cymru” investigating the question of “Who are the Welsh?”. To participate, members of the public were invited to buy a Y-DNA or mtDNA test from the company’s Welsh website. But the results of this “research” were not published in a scientific journal. Instead viewers were regaled with stories about the ancestry of celebrities, for example, that their Y-DNA or mtDNA results indicated they were ancient Welsh, pioneers or Rhinelanders. Yet these descriptions are so generic that they apply to ancestors of almost anyone: they are essentially meaningless. Y-DNA and mtDNA comprise just 2% of our DNA, and convey very limited information about the history of a nation. So how could this happen? Two principal actors in the company were a geneticist from The University of Edinburgh and an historian and former television executive who at the time held an unpaid position as Rector of St Andrews University. The university roles of the company’s directors were used to lend credibility to the promotions. The media outlets did not seek the views of other scientists, who would have contested many of the claims. Few journalists have scientific training, which can allow sensationalised or unbalanced reporting. And while most scientists can be relied upon to be objective, journalists need to be aware that research-related commercial interests can affect scientists’ motivations. We formed part of a small group of concerned scientists who tried to challenge this avalanche of marketing disguised as science. This was prompted by an interview on the prestigious BBC Radio 4 Today programme, which described a “massively subsidised” project to study the DNA of Britons as “bringing the Bible to life”. In fact, the interviewee was there to sell DNA tests and the BBC interviewer turned out to be an old chum. Our challenges were met with legal threats from the company, and resistance to acknowledging editorial failure from the BBC and other media. Many scientists don’t speak out because of a fear of legal action. We were fortunate to have strong support from the then UCL Provost, and from many colleagues. So we decided to continue to challenge the misleading claims. We were also encouraged by the science writer Simon Singh, who had himself been sued by the British Chiropractic Association for critical comments made in The Guardian. Although the case against Singh was eventually dropped, he suffered years of personal stress and substantial unrecovered legal costs. We also received support from the charity Sense About Science, and we worked with them to prepare the pamphlet Sense about Genetic Ancestry Testing and an article on Sense about Genealogical DNA Testing. The satirical magazine Private Eye was the only media outlet to see through the company’s misleading media campaign from the start. But eventually we had complaints upheld by the BBC, which also aired a radio documentary that partly corrected previous claims. Over a period of years we got the upper hand. The company did not pursue its legal threat and eventually went out of business. With a move to genome-wide genetic data, containing more information than is available from Y-DNA and mtDNA, there is reduced scope for fanciful storytelling today. However, there remain problems with ancestry companies failing to reveal limitations of their analyses or to indicate uncertainty in inferences. The population labels that are used are not well defined and can conform to outdated notions of race and identity. Our story has wider implications about the relationships between business and academia and the reporting of science stories in the media. We hope that our case study will be used to inform media training and education programmes, and that universities monitor the abuse of academic position to advance business interests. Most importantly, we hope that other scientists will be encouraged by our experience and will not be afraid to speak out against bad science. Academics pan Melrose-based DNA business – an overview of our paper from Ewan Lamb on the Not Just Sheep and Rugby blog. Talking Headlines with Debbie Kennett - My interview with Talking Headlines about our BritainsDNA paper, the lessons learnt and how to detect fake science news.